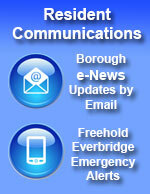 Freehold Borough is governed by six council members and a mayor. Council members are elected for a three year term and the mayor is elected for a four year term. The governing body is empowered to adopt local ordinances and pass resolutions. The governing body conducts all of its business during monthly meetings open to the public.